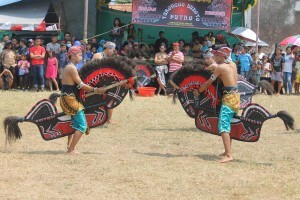 Reog is a traditional dance, originating in East Java. There are several versions of the story, its origins, and the type of dance. The dance which we saw featured physical strength and invoked magical spirits through trances. One version of the story says that a king had a beautiful daughter who he wished to be married. After consultations with the gods, the daughter said she would only marry a man who could present an exciting dance performance that had never before been performed and with gamelan music. There should be 144 twin horses and in the end he should be able to present her father with a two-headed beast. There is much more to the story but this is more-or-less the part that we saw. We were invited to a small village about ½-hour motor bike ride from our house. We saw the dance performed three times by varying degrees of experience. Unfortunately, when the more experienced, and probably better, performers began, we had already been there 5 hours—much of the time standing in the sun so were tired and ready to leave. The performance seemed to be a part of a “county fair” event. It was held in a large open area with a lot of food stalls, “fair- type” games for children, souvenir stands, etc. A large area was roped off in which the dance took place. Six dancers with six large wooden horses did battle with one another. 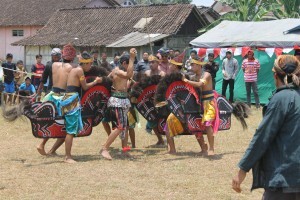 The dance included a lot of Javanese dance footwork. At one point, they all came into a circle and came out in a trance. Toward the end, the “head” spiritual man enticed them with water and flowers. Eventually they fell down and passed out. At some points in the trance, the dancers acted like horses, drinking water out of a tub and eating food like a horse. It was all fascinating—and a bit unreal. When we were ready to leave our hosts thought we should have a number of photos taken—with the horses and with some of the dancers. We should note that the people we were with knew almost no English so most of what we learned was through our limited Bahasa Indonesia (and the web)! This entry was posted on Thursday, October 1st, 2015 at 5:32 am	and is filed under Indonesia. You can follow any responses to this entry through the RSS 2.0 feed. You can leave a response, or trackback from your own site.